SHOCK- another bus-related blog post. I don’t suppose it comes as a surprise that this post is loosely related to my rather unfortunate choice of transport: the public bus. But this time, hear me out, I have to share this. 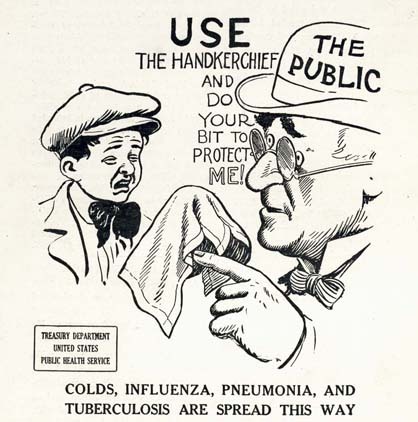 Public service cartoon instructing citizens how to prevent the spread of colds, influenza, pneumonia, and tuberculosis. © 2007, Missouri Historical Society. Picture the scene: there’s an OLD man sat at the front of the bus, rather annoyingly coughing and spluttering everywhere (FYI, I’m not attacking anyone, especially OAPs who have a cold). He sneezes (into his hand, not a tissue) then wipes his hand on his trousers. Then he continues to hold onto the chair in front of him, surely transferring some of that… gross-ness onto it. And then he coughs, on his hand, that he holds the hand rail with, before pressing the button and buggering off. Brill. My issues is that his germs are now on that rail. Sat there; festering. Ready to spread their fluey germs to the next unsuspecting victim. Well no, I’m taking a stand. WHY did I never realise this before!? Anybody can then touch that, which means they may as well be touching the gross thing the person touched in the first place- phew. I bite my nails, but I have significantly cut down, ensuring I wash my hands prior, as to make sure nothing untoward is entering my mouth (cheeky). But just a request- if you need to sneeze, learn how to control it, so you’re not sharing the germs around. That kind of sharing is not caring. So, that’s my rant over. I will just conclude on a more positive note- a small bottle of anti-bac has nestled its way into my handbag, and it’s there for the long haul. Have some courtesy please, GERMS ARE NOT FOR SHARING.